This beautiful young lady is cuddly and loves people. Her name is Freya and she is looking for her forever home. 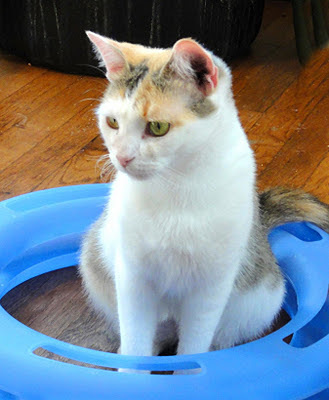 The calico kitty was rescued from a shelter. She was pregnant but, unfortunately, she lost her kittens due to her young age. Freya is available from PALS in Broomall, PA. This week I featured The Black Cat Cafe a french-style restaurant that the animal rescue group runs and all the profits go to help cats. I thought it would be nice to put the spotlight on one of their kitties. Freya gets along with other cats and dogs. She has tested FeLV/FIV negative, is current on vaccinations, parasite-free and litter-box trained. You can see more pictures of Freya at Petfinder. You can also check out other cats from PALS looking for loving homes at Petfinder. Freya sure is beautiful! I used to live with calico girl and she was very sweet. I hope Freya will find her forever home very soon! Freya sure is a beauty! We are purring and praying that she finds a forever home for the holidays! One calico is enough for my household. But I hope she finds a good one.